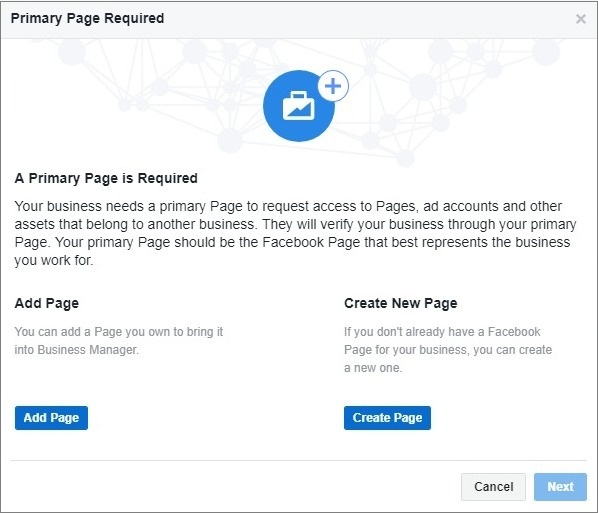 Facebook Business add-on is created for setting up FB dynamic ads to promote products of your store to people who are interested in what you offer. Relevant items from your product catalog will be shown in FB feed of your potential clients. To start using FB Business on your webiste, go to Dashboard and press Enable and Save. There are two ways you can receive data from FB Business add-on: via XML file or URL of an XML file. Click Download toggle icon to be able to download an XML file. 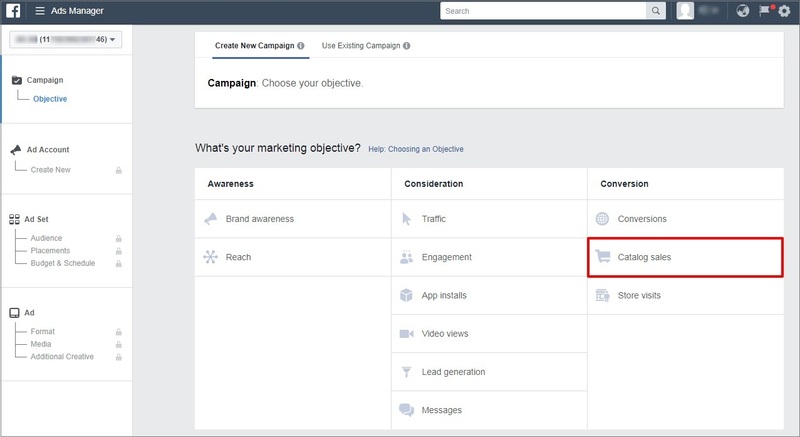 Select a category you want to involve into FB dynamic ads. Choose one or several categories to generate your product catalog for. Please make sure your product categories match Google requirements (check the Category Settings paragraph set out below). 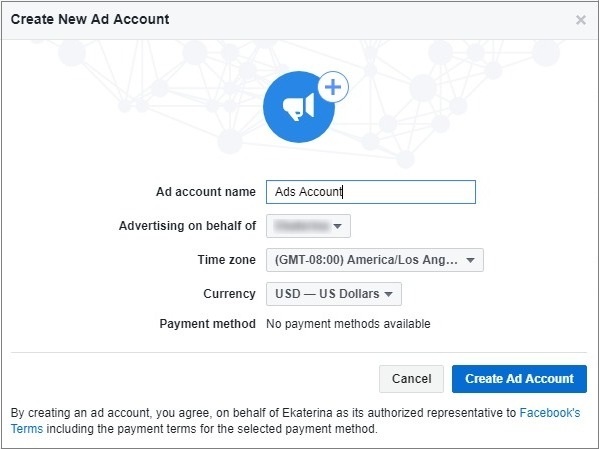 Select currency to be shown in your FB ads. Click Generate XML file. Once the progress bar has shown 100%, proceed with the download by clicking the green button XML file. If Download button is disabled, URL of an XML file will be generated so that you can copy it and paste in your FB account. It is important you match your product categories with Google product category attributes to meet Google taxonomy. Google attributes indicate the category of your item to help your potential customers navigate their way to your goods. The full list of product categories can be found here. To start mapping your categories, go to Category Settings and click Add New. First, select your website product category. Choose a corresponding Google category which matches this website category best. Click Save. You can upload the feed using your Ads Manager, which can be accessed through your FB personal account. 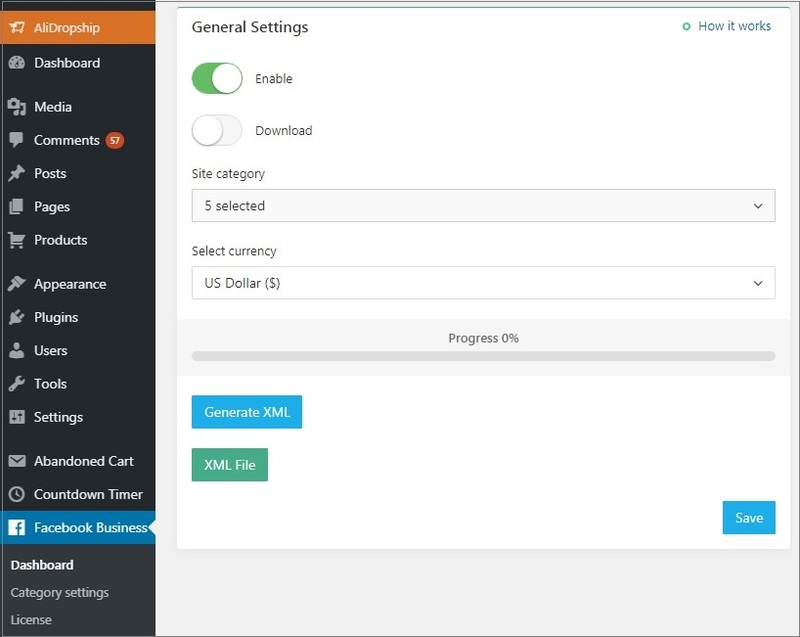 Alternatively, the catalog can be added in your Business Manager. You may need to set up Business Manager if you are an agency representing another business, or you want to share access to your product catalog with people on your ad account. Please note that if your business supports multiple languages, you’ll need to create a separate catalog for each language. Choose Catalogs in the top menu. 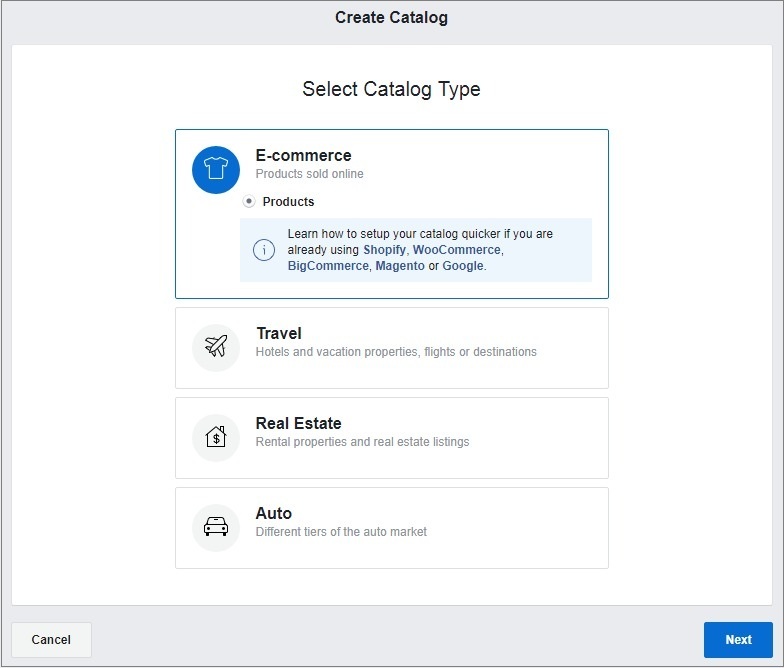 Select E-commerce as your catalog type and click Next. Name your catalog and click Create. Continue by clicking View Catalog. Once your catalog has been created, you can start filling it with your products. 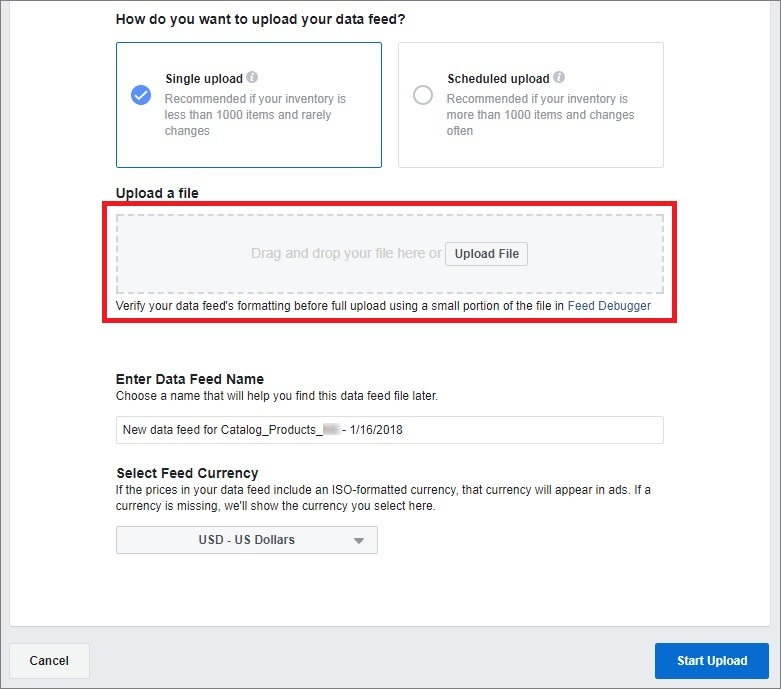 In Data Sources you can choose how you want to upload your data feed: through a single or scheduled upload. Choose Single Upload to upload the XML file you have downloaded from the add-on. This method is recommended if there are no more than 1000 items in your web store and your do not make changes to them frequently as your data feed will not be updated. If you are interested in recurring uploads, select Scheduled Upload. Copy and paste your XML URL you have generated with the add-on to set scheduled upload (daily, hourly or weekly). Click Start Upload. 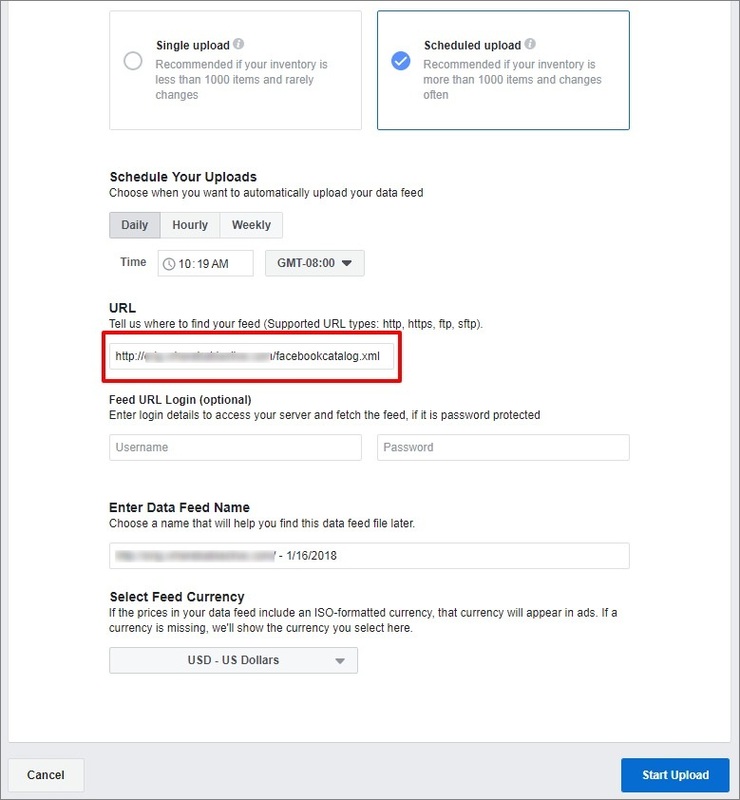 FB Ads Manager will upload a copy of your data feed automatically at the frequency you set. 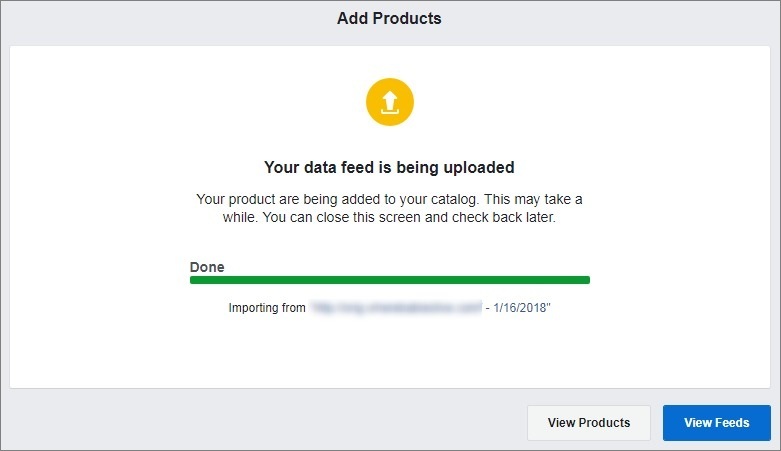 Once your data feed has been successfully uploaded to your FB Ads account, you may check the products by clicking View Products. 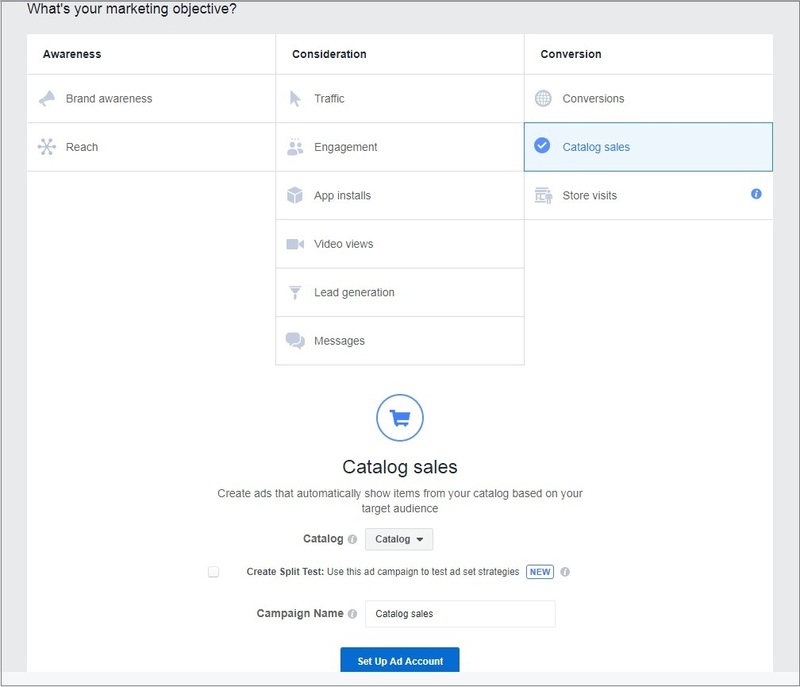 You can not only manage some certain products, but also create product sets for more control over the items you show in your Facebook ads. 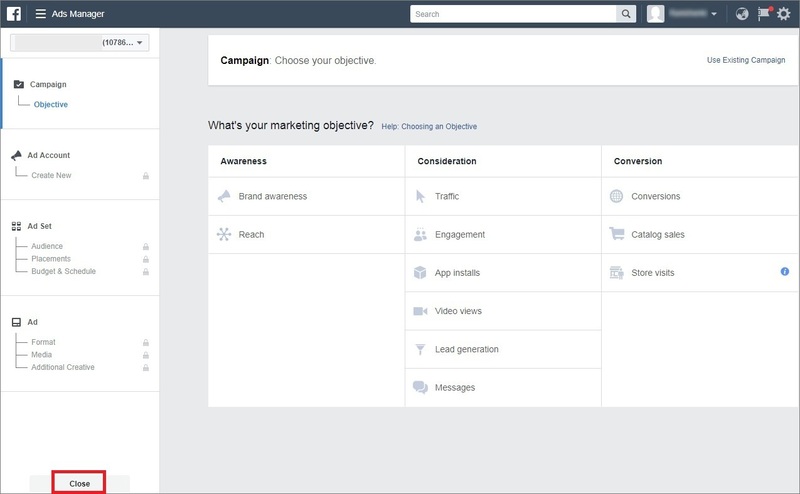 With product sets, you can filter groups of similar items you want to advertise in a particular FB ad. Besides, it is also possible to specify who you want to see your ads. To start creating a campaign, go back to Ads Manager and choose Catalog Sales as your marketing objective. 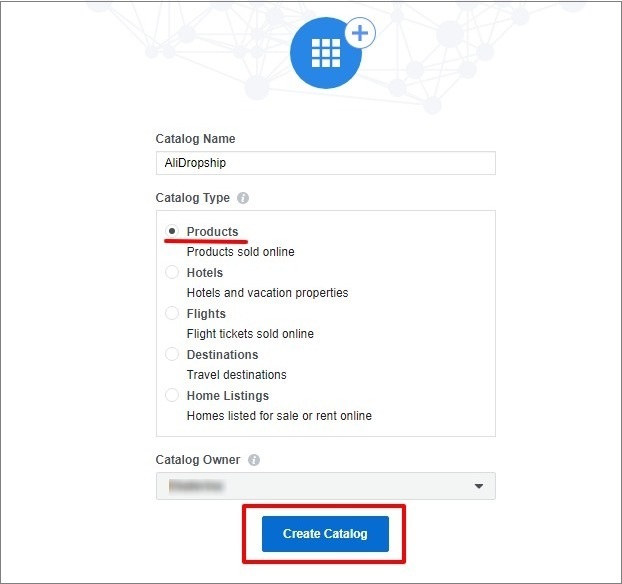 Once your account is created, proceed to Business Settings to link your Ad Account. 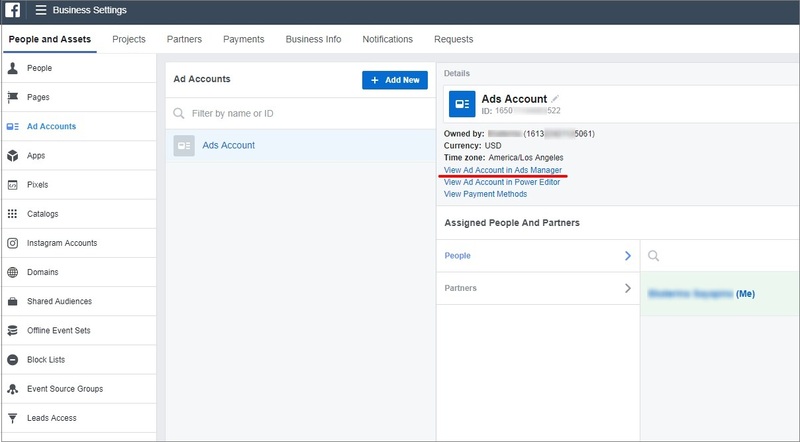 You can Add an Ad account, Request access to an Ad account or create a new Ad account. Copy and paste your Ad account ID to Add Ad account. Add your FB Page or create a new one to Request Access to an Ad Account. Fill the requested fields to Create a new Ad account. 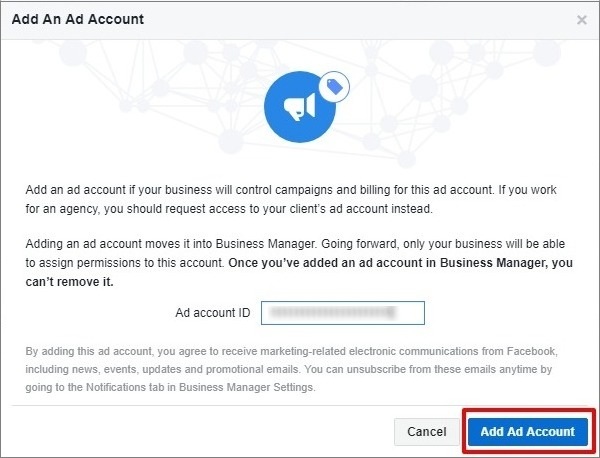 Now you can access your Ad account from your Business Settings. Before starting a campaign choose its marketing objective – Catalog sales. 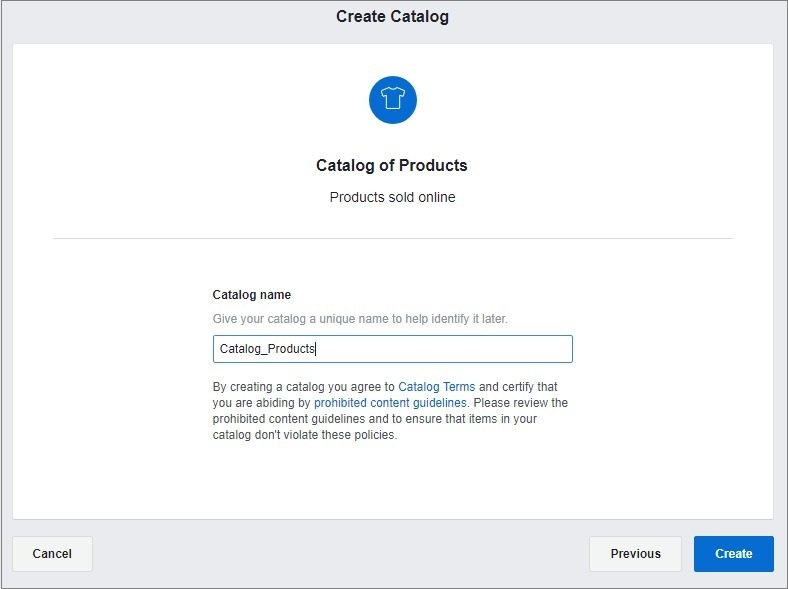 Enter your Catalog Name and choose the Catalog Type – Products. Hit the Create Catalog button. As soon as your Catalog is created, you can add Data Feeds. If you are interested in recurring uploads, select Scheduled Recurring Uploads. Copy and paste your FB Business URL you have generated with the add-on to set scheduled upload (daily, hourly or weekly). 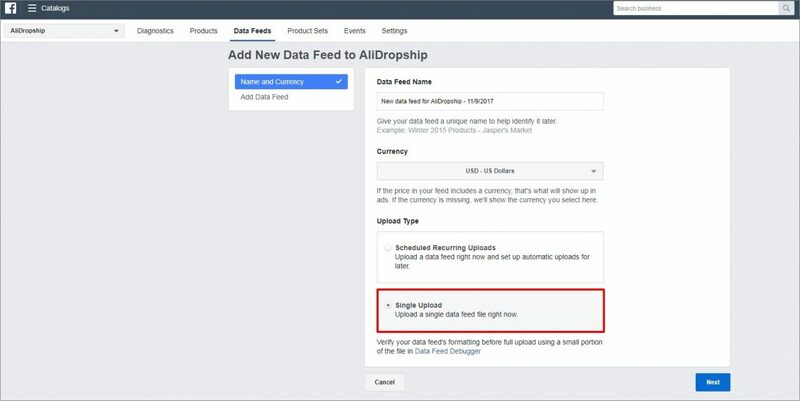 FB Business Manager will upload a copy of your data feed automatically at the frequency you set. Choose Single Upload to upload the XML file you have downloaded from the add-on. Upload the XML file and click Next and then Add Data Feed button. Go to Products tab to check the uploaded items. You can learn more about managing items in your catalog here. Please make sure you have set up FB Pixel as it will report which products your customers viewed, added to cart or purchased. For further guidance, click here.